I use it because it causes dermatitis with cutting oil. Until now, we have used M size of other companies. I tried to buy S size because the finger is thick and short. "Ultra-thin" I bought it so I will tear it when I wear it. This is my mistake. The cause is that palms and fingers are thick but fingers are short. I should have made M → S the other company's products I have used so far. This review is about item#46420482. I was glad that I could buy it cheaply, but I can break it soon. Can not manage anything? This review is about item#46420525. There was a time when it was easy to wear it in hand, and it was long, I will not buy this product again, I can not recommend it. This review is about item#46420507. It is too thin to use. It can be torn soon. It is the same as not wearing gloves. 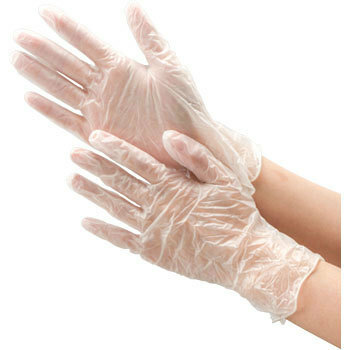 It is easy to break, not suitable for protection of fingertips from detergents and chemicals. Especially even when the nail part touches a hard part, the hole opens, the claw part is broken by squeezing the cloth rinse, the hole opens in a few minutes from the start of work. The feeling felt with ultra-thin, powdered is good, so stress will also decrease if you think it is suitable for price. The fit is excellent, as it is thin. I think that it is easy to break a little. It is obviously less durable than other products nominating the same thickness. If you use it for a while and throw it out immediately, it may not be a problem, but it was not suitable for your own use. Just by temporarily tightening the bolt by hand, the hole opens in work such as oil change. Honestly I am not suited for this kind of work. It is a loss of cheap buying. I am disappointed. I think I will buy a nitrile, but I am worrying about how to use the remaining 90 sheets. I tried using it based on your evaluation, but it was completely disappointing. First of all, there were a lot of tears when gloves were worn. Despite the fact that it was not torn in waste oil work, hands are completely black when a little long time passed! This is a clause! It is! It is better in the nest ◎ It may be cheaper depending on the application you use! Is it? I bought it because the price was cheaper than natural rubber gloves, but I can tear it immediately. (Is it harder than rubber?) It is regrettable though natural rubber gloves are better to use hard. It depends on purpose of use, but it seems not suitable for maintenance work. Unfortunately I will not order next time!